Based of the popular movie character Alien, Alliens debuted in AAA in 2004 as a mid-carder who was an above average worker. In 2006, he was relaunched as the leader of the a stable known as Los Alienigenas that also included a gray beast Kriptor, a chameleon like alien Mungo and their mini snail-like monster Mandrox who feuded with Alebrije and Cuije. The new group was dropped after only a few weeks. 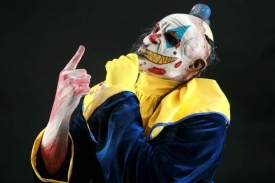 Alliens has appeared as a solo rudo on rare occasions since, and it's rumored he is currently playing the role of Monster Clown in the Psycho Circus trio. This page was last edited on 26 August 2017, at 20:24.